From left to right is Vickey Duxbury, John Baker, Toni Vorwerk, Leroy Eickhoff, Michelle Meldahl, James Eickhoff, Deb McDonald. Not pictured is Teresa Swenson. First Responders since 2005, Ambulance Service prior to that. 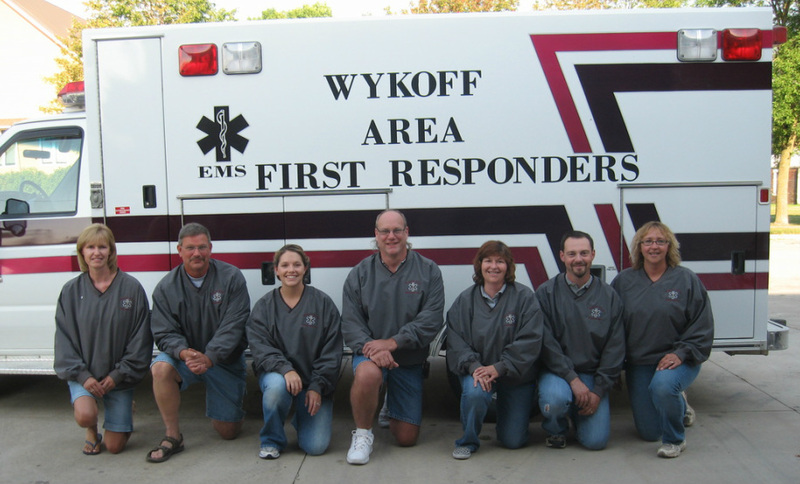 Wykoff First Responders started as a volunteer ambulance service run by the fire department. In the mid 70's the ambulance started as a seperate city service and operated that way until April of 2005. After pleas to the community for new members were unanswered we were unable to keep the 24/7 staffing requiered for an ambulance service. It was decided to continue as a first responder squad. At that time and our service area was split up with surrounding ambulance services of Spring Valley, Preston, and Chatfield.